Comments Off on When is a strength a weakness? When is a strength a weakness? How do you turn a strength bad?… easy, you overuse it. If you have the ability to translate the feeling of anger into a calm rational response, that will serve you well in most situations – until that response is perceived as not caring, or ambivalence. The ability to always have a clear, strong opinion can be seen as an important leadership skill, until it becomes or is perceived as being singled minded, unthinking selfishness. And that competitive streak can help you succeed – until winning at all costs spends farness, dignity, or character. If an ability is under-used, or simply not seen we often call it a weakness – oh, they’re no good at… We should say the same of a strength that is overused. In mathematics there is a ratio called the golden ratio, sometimes described as the golden mean. We use it in visual layout/design and architecture to produce something that is pleasing to look at. 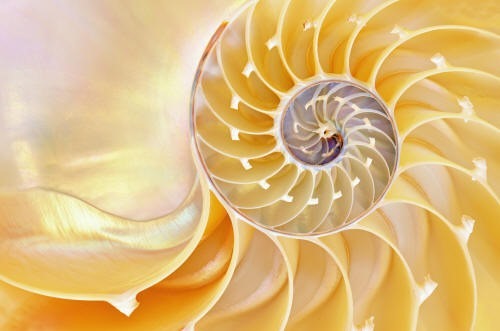 It appears in music, geometry and nature (such as the nautilus shell above). Aristotle used the golden mean to describe the desirable middle ground between two extremes – the Wikipedia author uses the example of courage as a virtue, which if taken to excess would be recklessness, and if missing would be cowardice. In my view, a strength is an ability or trait used wisely. This brings a new perspective to ‘working on your strengths.’ It’s not simply about building strengths, but knowing when and how to use them, becoming adept at hitting the golden mean. Thank you Aristotle.